Have you ever tried a mango lassi? It's a delicious frosty drink that originated in India. The recipe is so simple: mango + yogurt + cream + sweetener. I like a pinch of cardamom or a tiny bit of rose water added to the mix, too. It's something I crave on hot summer days. I felt it was only natural to give it a Popsicle makeover. 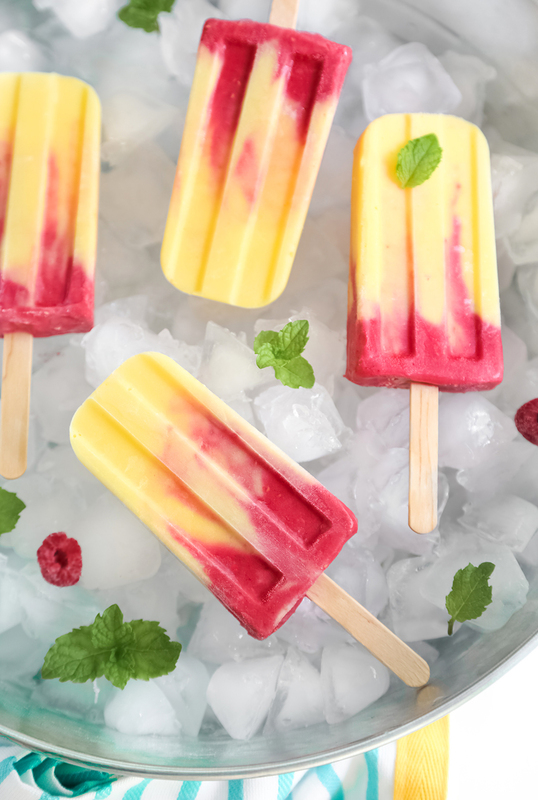 Mango with raspberry is one of my favorite flavor combinations. Perhaps it's because they are both so floral. I also love how the bright saffron color of mango plays against vivid red raspberry puree. 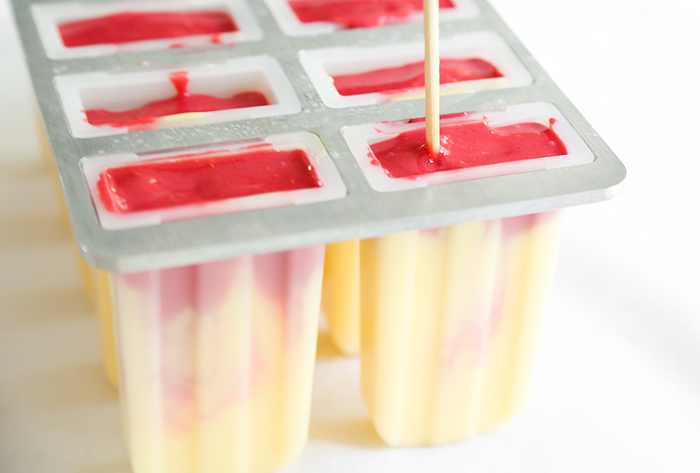 I filled the ice pop molds about 2/3 full with mango lassi and then topped them with sweetened raspberry puree. You can place a long skewer in each mold and swirl it around until the mango is marbled with raspberry. 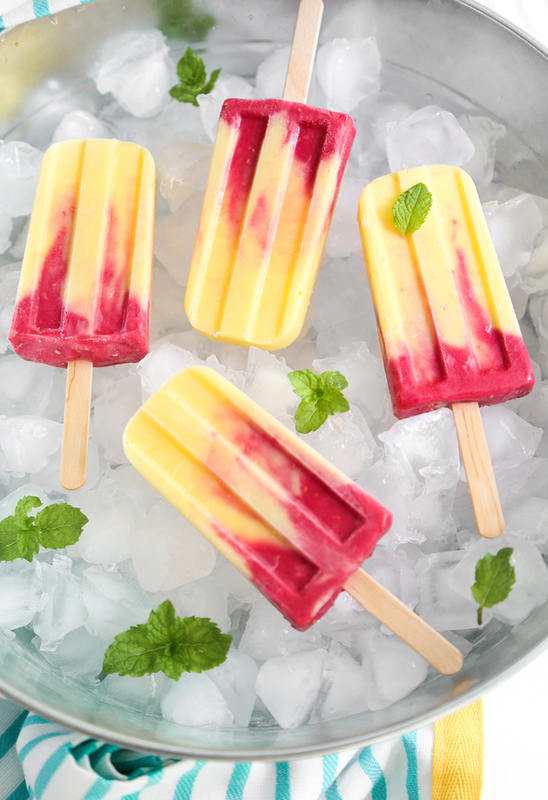 These ice pops can be whipped up in snap! Fresh mangoes are always preferred, but I'll admit to having an extra-large bag of frozen mango chunks in my freezer (thanks, Costco!). If you're too impatient for ice pops (I've been there!) the blended mixture can be poured directly into two tall glasses for instant gratification. Sugar is variable in this recipe. I suggest adding it a little at a time and taste-testing until the desired sweetness is achieved. Mango is usually very sweet but occasionally tart. 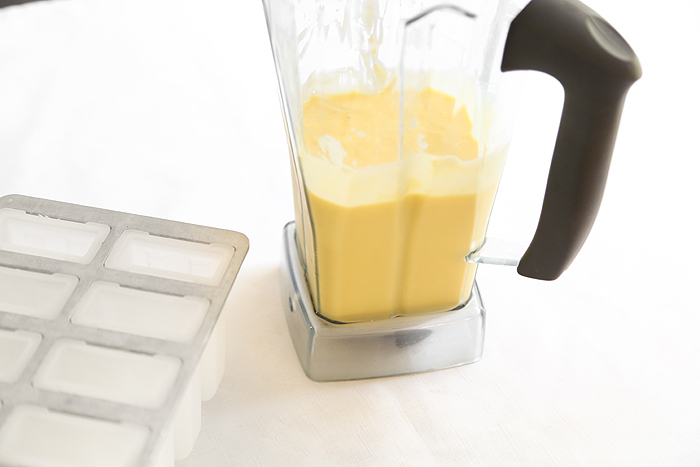 In the pitcher of an electric blender, combine the mango, lemon juice, yogurt and milk or cream. Blend until smooth. Add more milk or cream if needed to blend smooth. Add granulated sugar to taste and blend well. Add cardamom to taste and blend well (I use just a pinch!). Pour the mixture into ice pop molds 2/3 full. You may also use disposable paper cups if you don’t have an ice pop mold. Clean the blender pitcher and add the raspberries. Blend well. Add sugar to taste. Pour the puree through a sieve to remove seeds, if desired. Top the mango lassi mixture with the raspberry puree. Use a long skewer or a butter knife to swirl the two mixtures together until marbled. Insert ice pop sticks and freeze for about 6 hours or until solid. 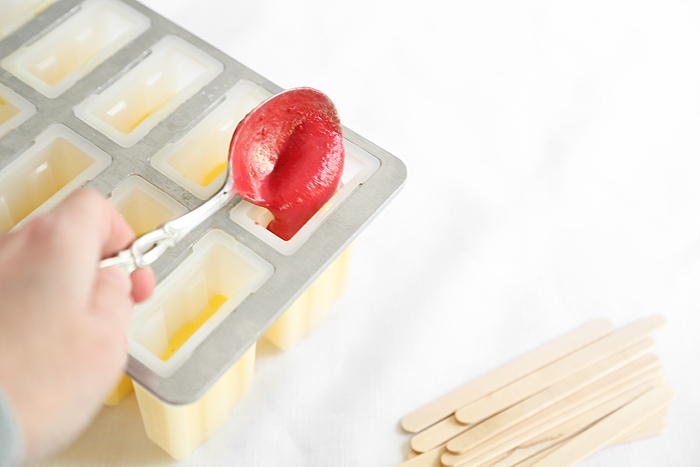 To unmold ice pops, dip the molds into hot water for 3 seconds, and then gently but firmly pull the pops out by the ice pop sticks. Note: Omit the ice pop molds for a Mango-Raspberry Lassi drink. Divide the mango lassi mixture between two glasses and top with raspberry puree. Swirl together with a straw and enjoy! Hi there, just wondering where you got the moulds for these popsicles? Thanks! Cardamom is really good for you. I wonder if I can use coconut milk. Will try it!